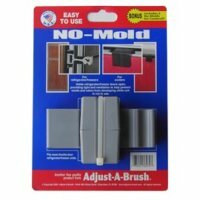 If you’re worried about mold building up in your refrigerator, then perhaps the No-Mold Ventilating Clips would be able to keep those fears at bay. Prevent mold from forming in unplugged refrigerator/freezers with No-Mold! This ventilating clip holds the door slightly ajar – letting in just enough light and air to help reduce moisture (which causes mold growth), yet securely keeping the door “closed” to maximize storage space. Fits most double-door refrigerator/freezers – durable, easy-to-use clip easily holds open both doors on a single unit. Set includes one double-door refrigerator/freezer clip and 2 clips for coolers. These puppies retail for $6.95 a pack. Just remember to use a strap lock to keep the kiddos safe.